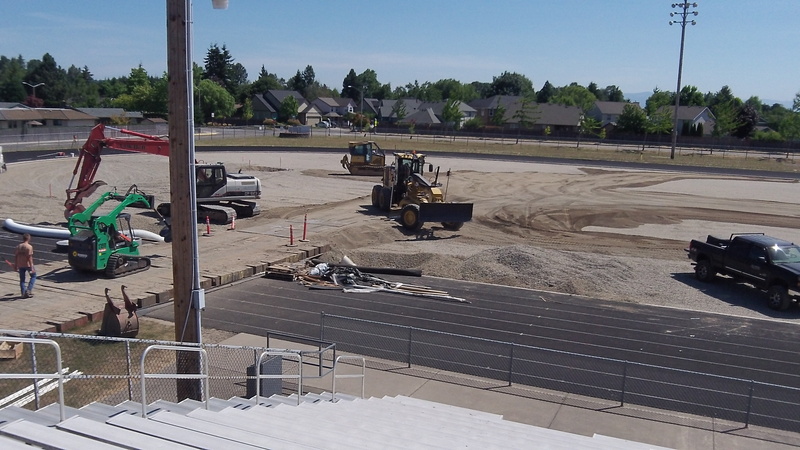 As you can see and hear in the video, workers have been laying the groundwork for installing artificial turf on the football field at South Albany High School. They hope to be finished by the time the field will be needed, and I hope they make it. This was the view from the bleachers at South Albany High on Thursday. Last spring, when the project was still in the planning stage, the idea was to have the field open for use by August. That didn’t quite work out. From the looks of it on Thursday, a few more weeks likely will be needed before any activities can be held on the new surface. South Albany boosters and other volunteers launched what they described at a July 8 meeting of the Millersburg City Council as a million-dollar project. Greater Albany Public Schools agreed to fund $240,000 of the cost. Much of the rest is being covered with donations of money and labor as well as pledges of future contributions. At that meeting on the eighth, the Millersburg City Council agreed to kick in $25,000. On July 23, the Albany City Council was asked if the city could waive some fees to help the project along. The answer was not to waive any fees but to consider having the city pay the plumbing fee for the project, about $4,600. That may seem kind of chintzy on the part of the Albany council. But consider the city’s long history of partnering with the schools with big dollars for sports and recreation facilities. Among recent major amounts, Albany paid GAPS $400,000 toward a gymnasium at Timber Ridge School in 2012, and it paid the school’s $36,000 local improvement assessment for a street. The city also supports the community pool at South to the tune of $340,000 a year.